To create awareness among the people regarding blood donation and to fill in the scarcity of blood in the hospitals, sanstha organizes blood donation camps in every 4 months. This social cause started in 1991 on the auspicious occasion of Ashadhi beej. Since, then it’s been 24 years, this noble cause is going on smoothly. Since, 2009 underneath ‘Anchorwala Blood donation drive’ camps are been organized in the various parts of Mumbai and Kutch on the same day. In the year 2011 blood donation camp’s Golden Jubilee was celebrated. On that particular day in and around 55 destinations such camps were organised. Till date sanstha has collected around 95,847 units which itself is a big achievement. To make blood available to the needy people as and when needed special arrangements are made by the sanstha wherein they can get blood without much hassle. Various zones had been formed and dedicated volunteers are assigned to provide blood when needed. Such noble drive run by the sanstha which have enlightened the life of the needy people have left a lifelong imprint on the humanity and the society and has also inspired other sansthas too who are working for different sections of the society to join in such campaigns and inspired volunteers to work with full dedication for the society and for the nation. Special mention and high praise has to be given to Mr. Damjibhai and Mr. Jadavjibhai Anchorwala and their family for their warm support to such campaigns. - There are different types of camps organized in the various branches of the sanstha on the regular basis for example: Eye checkup , Gynac checkup, general body checkup, orthopedic camps, Asthma prevention camps etc. - Sanstha’s Palghar branch has started with a noble project with full preparation and had given the benefit of free cataract checkups and cataract operations to needy nearby residing tribals. - Along with this for the tribal community in Palghar area, a venture with the Tata Hospital in collaboration with ‘Indian Cancer Institute’ is run under which sanstha organizes cancer checkups camps on a regular basis for them and even financial support is given to the required needy patients. - Sanstha along with Matushree Laxmiben Ramji Keniya Charitable Trust – Kapayawala have started ‘Sick Bed Services’ in Bhayandar, Palghar, Nalasopara, Borivali and Govandi Wherein hospital bed, airbed, water bed, wheelchair, walker, urine pot, stick etc. are provided to patients at a very nominal rates. - Vitamin B12 and Vitamin D3 checkup camps are organised by the sanstha. 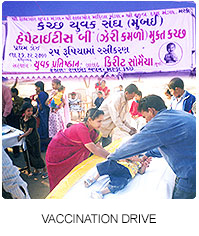 To make Kutch Jaundice free, in 1999-2000 a massive vaccination drive was launched in Kutch to save children from Hepatitis – B. Around 1,00,000 children were given vaccination. To create awareness among the people about how to prevent Heart attacks, Joint pains, Stress management and various other such Seminars are organized by sanstha. Along with this Workshops on alternative medicines like Naturopathy, Yoga, Acupressure, Aura heeling, Mudra etc are also organized by the sanstha on a regular basis.